1. To make 4 ghosts, you will need 5 tissues. 4 whole and one cut into quarters. 2. Lay one tissue flat on the table and center the quarter of the tissue on top of it. This makes for a fuller ghost head. 3. Place the top of the lollipop in the center of the two tissues. 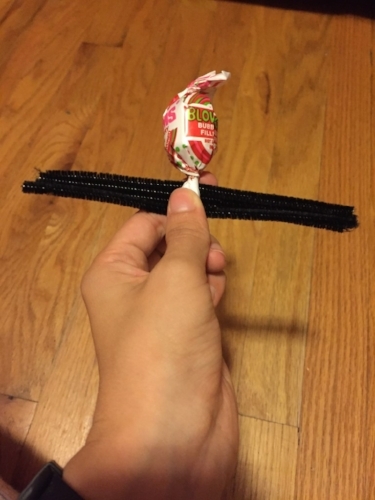 Wrap the tissues around the lollipop and use a small rubber band to secure it at the base of the lollipop. 5. Use the black marker to make a face for your ghost! Here is Tyler's ghost face. 1. 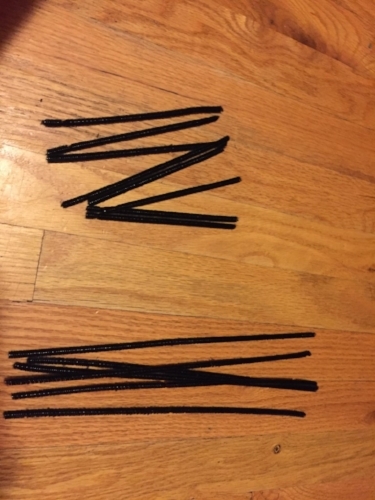 Take 2 black pipe cleaners and cut them in half. 2. Take the 4 short pipe cleaners and line them up placing the lollipop stick on top just left of center. 3. Wrap the pipe cleaners around the stick so that they cross once. 4. Leave a small section of the pipe cleaners flat (so you have a place for the eyes) and then bend a spread your spider legs. 5. Glue two eyes to the top of your spider. We used elmers glue so my son could do it, but a glue gun would help it stick better. This project was a lot of fun. Definitely better suited for a 3 year old than a 2 year old. Also, be sure to buy extra lollipops so you can enjoy some while you work! !